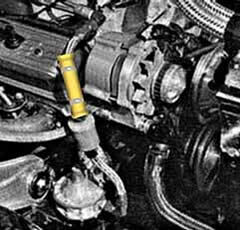 LARGE Fuel Ionizer for cars, trucks, motorcycles: The new large fuel ionizer provides an effective way of improving mileage and engine performance. 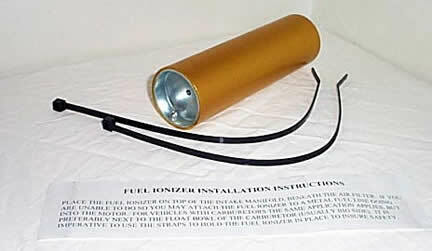 These golden aluminum energy tubes, regarded by many users as a scientific breakthrough for fuel consumption in internal combustion engines, is based on the concept that converting the 30% of neutral ions within petroleum, for example, produces charged ion pairs that can become usable energy. Applications include all types of gasoline, diesel, and LPG equipment, and every type of oil-burning furnace. Among the astonishing results claimed for the ionizer are more power, cleaner engines and injectors, reduced emissions, better mileage, and easier starting. The units are tied to the outside of the fuel line on any internal combustion engine between the fuel pump and the carburetor. If the fuel line is rubber, secure the Ionizer to metal near the carburetor or fuel injector.